Dream A Little Dream ~ KH3D Giveaway! Only twelve more days until Kingdom Hearts 3D [Dream Drop Distance] is released in North America. The two-year wait from its reveal at E3 2012 has been long and arduous, but we’re almost to the finish line! The waits for magazine scans late in the night, the excitement over new trailers and world reveals, all of the theories people would make; everything made the journey here one heck of a ride. Some of you have already spoiled the game, and others have been hiding your eyes from everything related to the new installment, but the one thing you all have in common is your desire to own the game. We know there are many of you who won’t be getting the game July 31st 2012. You might not have a 3DS, money to buy the game, time to play it, or just want to wait for whatever reason. Kingdom Hearts Insider is here to help you, but all we have is one request! It’s a fair trade, really. 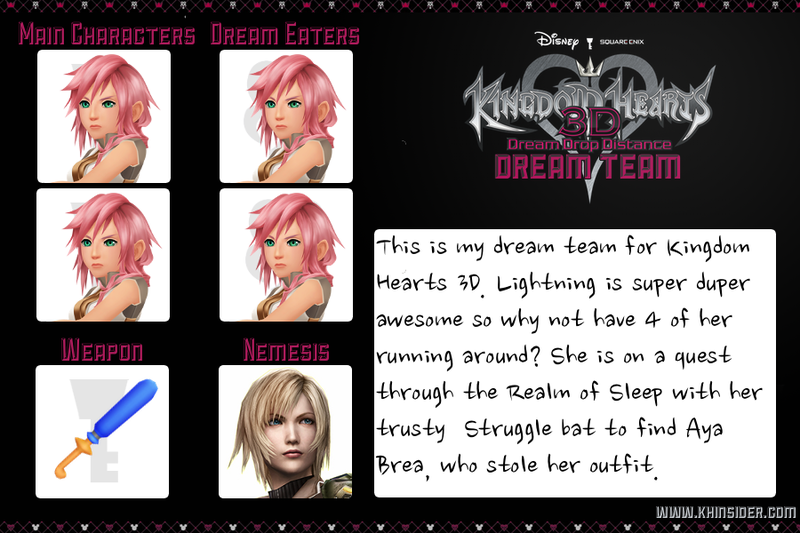 For (1) copy of the NTSC compatible version of Kingdom Hearts 3D [Dream Drop Distance] for the Nintendo 3DS and (1) copy of the Brady Games Kingdom Hearts 3D [Dream Drop Distance] Signature Series Guide, we want you to make a Dream Eater team! Now, now! Before you decide whatever we’re asking isn’t worth it, you can make your Dream Eater team whatever you want. Want to have Jafar as your main character and a Prize Pod Unversed as his Dream Eater? Sure! Batman with a banana as his weapon? No problem! Want to write us a poem about how perfect your team is? Perfect! Go outside of the boxes or even make it animated! The template is mandatory in order to enter, but is free for you to mess with as you please! The cards will be judged on creativity, humor, and originality. We will then pick three of the best and choose two winners at random, one of which will receive their very own copy of Kingdom Hearts 3D and the other to receive the guide. Here is an example made by our very own Souji Seta to get you started! 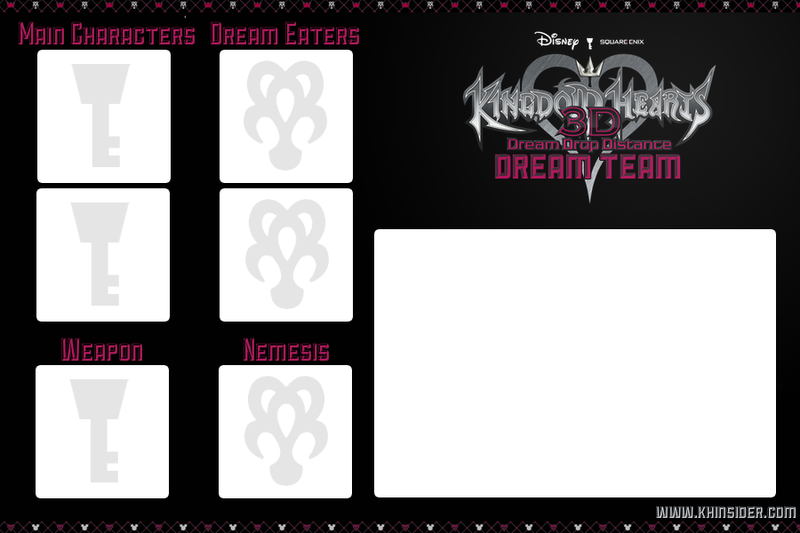 Upload your card to an image hosting site (like Photobucket or Imgur) as either a PNG or JPG file, and submit your entries to Sign, Master Spockanort, Souji Seta or Chaser through PM or send an email to us at kingdomheartsinsider on gmail by August 15th, 2012 at 10:00 AM PST. Winners will be announced the same day, so be sure to get your entry in as soon as possible! If you have any questions, you may leave them here in this thread or contact us personally through the methods above! Also, don't forget to submit something for our Kingdom Hearts 3D Countdown! Ok i have a question are we allowed to choose 2 nemisis's since were going to have 2 players? I don't really know what to do for mine since Seta's is so kickass. I'm going to enter~ I had a lot of fun making the back cover for the last contest. Is the size limit the size of the template you gave us? This is such an awesome idea! I would enter just for kicks. I don't even need the reward. Thank Seta for it~ He's the one who made the template and had the idea! I'm guessing this is a one entry per person deal? I live in Germany, so I can't join, but there is a question which really interests me. That picture of Lightning, is this original or did someone made this? It looks a Lightning Version of Kingdom Hearts. Was this what you told me to think a name of for? What a cool idea. Is it alright that I sent both an email and a PM? Just want to make sure you get it. ok I'm really kinda dumb but I'm still confused on what your email is...is it kingdomheartsinsider@gmail.com? Yes, only one per person. Also just to make it clear: we will contact you if you win. We don't need any address right now.